Late winter in Maine is when scenes like this can be found around any stand of maple trees. 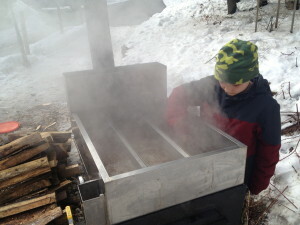 Boiling maple sap down to that heavenly elixir called maple syrup is as much a part of the Maine Mystique as the rocky coast of, the great north woods and hard shell lobster. I grew up on sugar cane syrup, black strap and the like. It was a heavier sweetness that could set your teeth on edge. There were some blends around that contained corn syrup which offered a milder treatment for your hot biscuits and pancakes but they were neither of the cane syrup sweetness nor the pure “you could just drink the stuff” quality of real 100% pure maple syrup. It was supposed to fool us deep south boys and girls into thinking we were sampling something like real thing. We were easy in those days. If it was sweet it was good. It wasn’t until I lived here and tasted some strait from the evaporator that I knew the truth. Now, straight from the evaporator is not quite the same as poured from the spout over those biscuits I mentioned. It is not quite “there” yet, but it has that earthy sweetness that still has something of the earth floating around in it. It works quite well in a cup of coffee. My neighbor called me early this morning to invite me over to hang out around the evaporator. It’s amazing how boiling clear watery sap can produce such a fine end result. We were finishing dinner and I noticed a truck coming into our drive which is kind of rare without us knowing ahead of time who it is. It was that same neighbor coming over the “safe” way rather than trying to avoid the fast traffic on the narrow shoulders, or slogging through the deep snow between our houses. You guessed it. He presented us with a pint of freshly “squeezed” maple syrup. And I helped! I think there may be a waffle or two in the morning. You think?